The beauty of Sinka Island. Sometimes we are confused about choosing the place to go relax. It seems that no more places to visit. Not for this holiday, because we are going to introduce you one of the new recreation place that you should try to visit. If you are bored going to the places that you always go to spend your holiday, for examples Pasir Panjang beach, Samudera Indah beach, and Gosong beach, so Sinka beach can be your new alternative place for having recreation with your friend or your family. Sinka beach is located in Sedau. There is a mosque in front of the way to reach the beach. 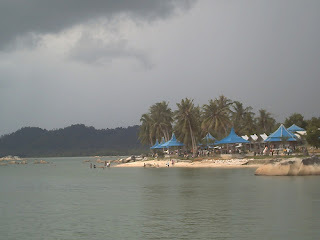 Just go ahead about 15 minutes, then you will find the beautiful panorama of Sinka beach. Sinka beach is not like the ordinary beach that you’ve ever gone. It’s very beautiful beach. The beach is very clean. You will find no thrash there. Only a few people have gone there. Because of it, it’s also a quiet beach. The sand is also white like Pasir Panjang’s. At the beach, there is a path that you can walk to so you ca get to the ideal place to enjoy the sightseeing there. If you stand at the end of the path, you will get a great feeling and feel an indescribable experience. You can relax and forget any problems that you have. You will forget all the stresses in your head. The water is clean and it has a few rocks, so you can swim there freely without being worried that your adventure when you are exploring the depth will be bothered by rocks. There are many places that sell food and drinks so if you are tired swimming, you can rest there. Besides enjoying the sightseeing of the beach, you also can also find and have fun with many kinds of animal there. Yes, there is a zoo at Sinka beach. There are many animals you can see. You can take some pictures of the unique animals or if you are afraid standing near to the animals, you can take pictures of some animal’s statues there. If you are curious about the place, then what are you waiting for? Prepare yourself to have a holiday one or two days there, and have the experience. I and my wife used to be here in the period of around 2005 to 2007 along with some friend's family together in a bus to the SInKa Island in Singkawang. Is it right in Singkawang? Yes, it's in Sedau, Singkawang. I myself actually almost went there around 2007 or 2008, but couldn't make it. It is very difficult these days , with two children that we had , to go somewhere else. We have to work very hard to cope with our responsibility to taking care of our children while eagerness to go somewhere due to we did not have any "pembantu" at home. We have to handle with care in every way. Having two children really tiring us, and also challenging and interesting. How about you my wonderful friend Miss Syahdini? Any "good news" from you? Ooh I see.. Maybe after abie n azka growing older you 4 will be easier to have fun together..
'That' good news is not yet kang, don't worry if there's any I'll make a press conference hehehehe..